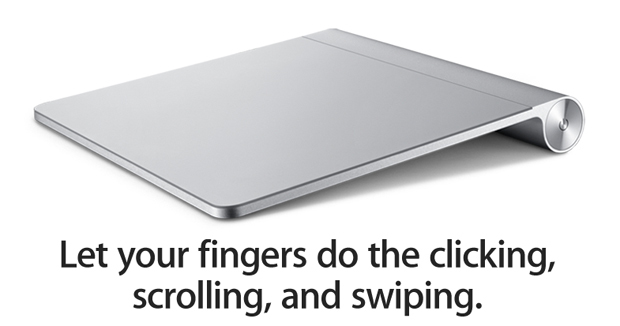 The rumors were right: Alongside new Macs, Apple’s revealed its newest gizmo–a Bluetooth trackpad. It’s designed to bring the same sort of multitouch goodness that MacBook users have experienced for months to iMac or even PC folk. The trackpad’s been hinted at for months, and now we know it’s real, it’s Bluetooth, the leaked photos were exactly accurate, and it’s going to cost you $69 for the privilege of adding its multitouch finger-dancing goodness to your desktop PC setup. Apple explains that the Magic Trackpad (not Magic Slate, note–one of Apple’s other name options given its slew of trademark applications that hit in the months before the iPad arrived) is designed to do exactly what you think it would: Bring “all the fun” of touchpad action that MacBook people have been having to desktops. The one advantage the pad has is that it’s actually bigger than the MacBook’s already super-sized touchpad, with “nearly 80 percent more area,” as well as the same metal and glass construction. The design is 100% aligned with Apple’s existing Bluetooth keyboard, right down to the size, no-doubt to appeal to the aesthetic whims of Jonathan Ive and keep up the Mac’s high-style feel. And there’s another gem here too, which is a surprise: Apple’s evidently aware that it should keep a good eco-profile for all sorts of reasons, so now that it’s introducing yet another gizmo that takes standard AA-batteries (unlike the dedicated lithium rechargeable cells in much of the other portable Apple gear) it’s also releasing a battery charger. 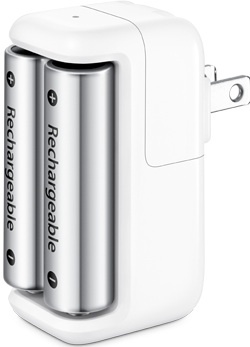 Yup, the plain-ol’ simple AA charger has been given some Apple polish, so that it can be a “more environmentally way to go wireless.” It takes design cues from the existing Apple mains adaptors, and even uses the same snap-in plug connector, so you can easily take it overseas. And, unusually in a world where you often have to buy a big pack of batteries in addition to a charger, it comes with six AA NiMH batteries–two for the keyboard, two for the trackpad or mouse, and two for charging. Is Apple moving into the peripherals game big-style? You have to wonder: First the own-brand Bumper case for the iPhone 4, then the Magic Trackpad and an AA battery charger. Should third-party makers get antsy? Maybe not: The charger alone costs $29.